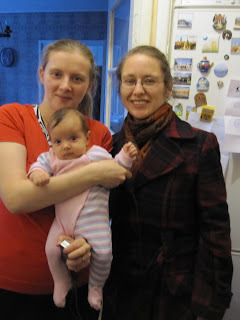 In the afternoon we visited our friend Olga and her baby Lena. In the evening we had dinner at the flat of cousins Lena, Roma, Mark, and baby Misha. But in between something unexpected happened. Most days we visit friends in the afternoon and family in the evening (or vice versa) on the opposite sides of the city. Not having a car, this necessitates a lot of backtracking by Metro subway. Today we (Olga) planned the day efficiently so we could take a nice walk between the two visits. 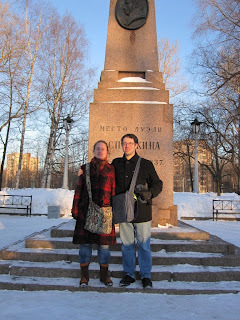 The famous Russian poet Pushkin died in a duel at a small park about halfway through our journey. While looking at a memorial column in the park, we were approached by a suspicious-looking 30-something woman who had been sitting at a bench with a man. Her - in English - to me> Are you from Russia? Her> Do you know who this is? Her> Do you want to learn more? Me> No but can you take our photo? 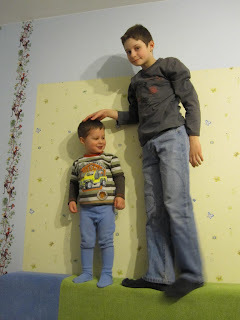 She tried hard to frame the photo, but somehow managed to cut off Pushkin's forehead and show a lot of the ground. I hope her history lessons are better than her photography. I wonder what that was all about. I wonder how she knew you weren't Russian, being with a Russian and all. Did she try to talk to Olga too? Sounds very strange.